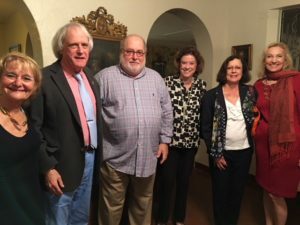 Recently, over 30 members of the Historic Preservation Association of Coral Gables gathered to hold the organization’s Annual Meeting and enjoy an evening at the historic Montgomery Botanical Garden –a nonprofit and very private 120 acre garden established in 1959 that opens only twice a year to the public. Guests renewed their memberships, enjoyed great camaraderie, and met new members while toasting past accomplishments and welcoming the New Year! President Karelia Martinez Carbonell opened the Annual Meeting by introducing Dr. Patrick Griffith, Director of Montgomery Garden, and thanking him for hosting the event. Dr. Griffith gave a brief presentation on Col. Robert and Nell Montgomery, their historic home, and their beloved garden. Karelia followed by presenting members with highlights of the past year that included a detailed update of the conversion and restoration status of the historic 1926 White Way lights—HPACG’s signature project for the last 7 years. Also, in the spirit of sharing preservation updates, Karelia invited new member Brett Gillis to give a brief explanation on pending projects coming up in front of the Coral Gables Commission in the near future. Finally, the 2018 Board Slate was presented and voted on. Congratulations to new and incoming Board of Directors—Lisa Bennett, Pat Button, Karelia Martinez Carbonell, Mary Anne Danguillecourt, Alice Goldhagen, Ann Goodman, Sallye Jude, David Mitchell, Ira Shapiro. 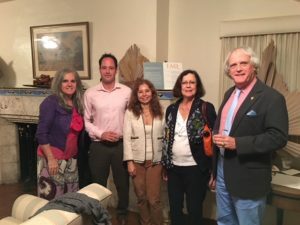 Established in 1991, the Historic Preservation Association of Coral Gables (HPACG) is a 501c3 nonprofit whose mission is to promote the understanding and importance of historic resources and their preservation.